In a bit of a hurry this morning — heading to work early — but I glanced out my window and saw this. Also, Hilary of The Yarniad tagged me for a book meme yesterday. Apologies for my lack of links — if you want to know more, these should all be easy to find on Amazon or wherever. I am between books at this split second, and am enjoying this week’s New Yorker, but next on the pile is The Omnivore’s Dilemma by Michael Pollan. I should have read this a long time ago — no excuses. A new friend shared his copy recently, which has rightfully moved it to the top of my reading list. 2. When you think of a good story, what are the first three books that come to mind? This is perhaps the most moving book I have read in recent memory. Relevant, heartbreaking, beautiful. Sometimes I catch myself being snobby about books, particularly more recent fiction. This helped me to break through that. Foer’s storytelling is excellent, and it is heightened by his attention to style and po-mo elements of narration/the relationship of the author to the reader. The way the words are presented on the page enhances their impact. I bought several copies of this book when I first read it and mailed it to everyone I swap books with. “The jagged mountains were pure blue in the dawn and everywhere birds twittered and the sun when it rose caught the moon in the west so that they lay opposed to each other across the earth, the sun whitehot and the moon a pale replica, as if they were the ends of a common bore beyond whose terminals burned worlds past all reckoning” (86). This is pure magic — a perfect read aloud book that children can enjoy, but is really very much for grownups. Water Genies, Processes too Complicated to Explain, Disconnecting Tools, Oceans of Notions…really. What are you waiting for? What 3 books would you recommend for summer beach reading? First of all, I’m swapping beach for mountains/high desert — which is where my current job takes me each summer. Secondly, I’m including poetry. Sorry if that means I am breaking the rules. I always look for this in used book stores — it is the perfect collection to share — great for tossing into a bag to take with you, no matter where you are going. My copy has a broken spine, and seems to attract pine needles, campfire ash and the occasional postcard from a friend. Because the summer sky is like none other. I always say I’m going to learn more about what appears as the evening turns from blue to black, but I rarely do. This is a book I remember from my childhood — a sea-faring (and far more sky-knowledgeable) friend and I purchased copies for ourselves 5 years ago as inspiration to be able to do more than ooh and ahh. 4. Any knitting books you care to share? I gather that I’m supposed to tag more folks — and as I like reading suggestions, here are my three: Mick at Much Adored, Macoco at Craft Pirate and Mel at Pipe Dreams and Purling Plans. 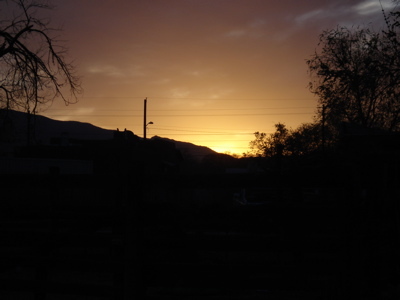 This entry was posted in blogland, from my front door and tagged books, friday, meme, sunrise by barefootrooster. Bookmark the permalink. Yay for being tagged! Yay! You realize, of course, this is asking for new levels of nerdiness. Asking an English Lit grad student for book recommendations? It’s like opening the gateway to Hades…or just my bookshelves. I just read RACHEL DONADIO’s essay, “It’s Not You, It’s Your Books,” in the New York Times Sunday Book Review today. Makes me cringe at the thought of revealing some of the bubble gum stuff I have read. Thanks for posting this. I’ve been going through a phase (can a couple year stint really be called a phase?) where I haven’t been reading as much, the stuff that I used to like to read has been a little too much for me recently – but I’m starting to get to the point that I really miss it and I know that I will want to read more challenging and elightening things again. Thank you for some great suggestions – some of the passages you’ve posted have me wanting to head for the library right this moment (except it’s closed. damn.) I’ll join in, just have to give it some thought since it’s been awhile! Thanks so much for playing along — I really enjoyed reading your selection. I’m definitely going to pick up a copy of Harvest Poems.